This enhanced-color view shows a swath of Jupiter’s moon Europa that's 217 miles wide by 466 miles long (350 by 750 kilometers). 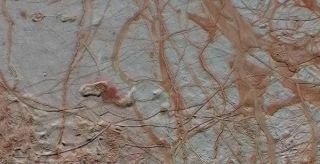 New research suggests that Europa's surface could be 95 percent porous, meaning a probe might sink if it landed there. Putting a lander down on Jupiter's potentially life-supporting moon Europa could be even trickier than engineers had thought. Europa's surface may be extremely porous, so any probe that touches down there might run the risk of sinking into a sort of extraterrestrial quicksand, a new study suggests. They found that powder composed of very small particles with lots of space between them — material less dense than freshly fallen snow, team members said — shared several key reflectance characteristics with the actual Europan surface. But the new study is far from the last word on the subject, study team members said. "Of course, before the landing of the Luna 2 robotic spacecraft in 1959, there was concern that the moon might be covered in low-density dust into which any future astronauts might sink," lead author Robert Nelson, a senior scientist at the Planetary Science Institute in Tucson, Arizona, said in a statement. "However, we must keep in mind that remote visible-wavelength observations of objects like Europa are only probing the outermost microns of the surface." NASA has Europa in its sights: The agency is developing a flyby mission to the icy moon, which is expected to launch sometime in the 2020s. This probe, known as Europa Clipper, will study the satellite's buried ocean and assess its habitability using a variety of instruments. Congress has also instructed NASA to get a lander down on Europa. The agency's current thinking calls for launching a surface probe separate from Clipper. The new study appears in the March 1 issue of the journal Icarus.